The summer season starts out with a bang… zucchini excites you. You receive heaps from your vegetable share and the neighbors are quick to share too. There’s zucchini bread to be made! But excitement quickly turns to anxiety because you’re drowning in zucchini. Perhaps you can relate? It’s the season that keeps on giving. I took a chance and made potato pancakes (kid approved) with zucchini (TBD). 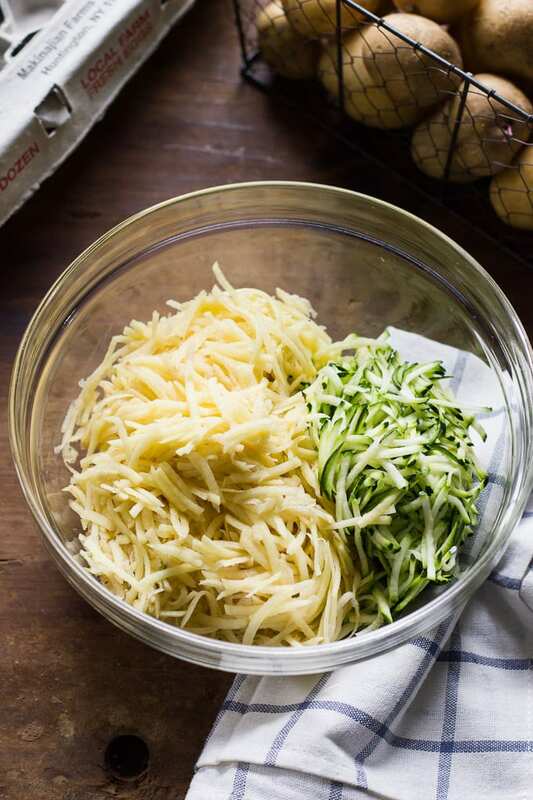 The traditional way to do this is with a box grater, but the food processor is a much faster method. My purist friend tells me this is cheating. Her grandmother would faint. But we’ll keep that between us, OK? I like shortcuts. Use the shredder blade for thin, uniform strands. Zucchini is made up of mostly water. Water = soggy pancakes. After you shred the ingredients, place them onto a clean kitchen towel and gently squeeze out the moisture. Add to a large bowl with one egg and a dusting of flour. You can also use rice flour for gluten free. These are your binding agents. 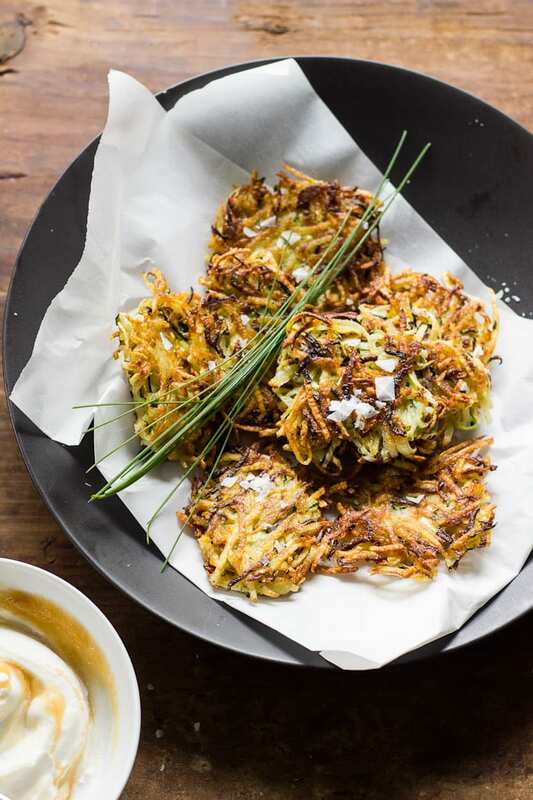 What is a potato pancake anyway? Potato pancakes are made from grated potatoes, onion, eggs, and flour. They are pan-fried until golden and crisp. 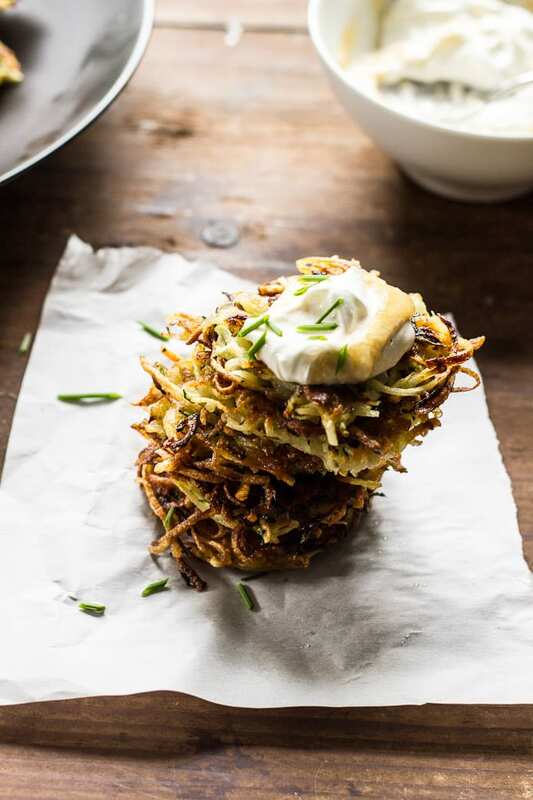 They kind of remind me of hash browns… I could happily eat them straight from the pan however sour cream and applesauce are common accompaniments. We’ve tried ketchup too. Don’t judge. Here, we’re faced with the repetitive task of shaping and frying. This brings me back to my intern days as a prep cook; I would peel potatoes for hours and pit olives until my eyes crossed. Not fun. To make it easy on yourself, prepare a small batch (this recipe yields 10-12) or 2-3 whole pancakes cut into wedges. The latter happens to be a very cool presentation. You could always commission some friends to help too. They like this kind of stuff. What’s up with the marbled yogurt? I sub low-fat yogurt for sour cream and mix with applesauce. Unless it’s pink, applesauce looks a bit drab by itself, don’t you think? Top your pancakes with this sweet and tangy condiment as you wish. My ratio is 1:1. I can’t even begin to tell you how important this is. If your mixture is under seasoned, your pancakes will taste flat. They must have just the right amount of salt, pepper, and onion. Sure, you can season once they’re done but it’s no comparison when stirred into the mix. It’s like eating bland pasta. To test batch, fry a small dollop and give it a taste. What does it need? Now is the time to go back in and make adjustments before diving into mass production. Same rules apply to meatballs, meatloaf, fritters etc. Bonus tip: use a non-stick pan. Less oil is needed and they won’t stick. My kids hated it. Not because of the zucchini, but because of how they were shaped. They did not resemble perfect circles (there were too many ‘things’ sticking out). We call that rustic, OK? They were thin and crisp on the outside and slightly soft in the center. Just how I like them. We still have plenty of zucchini to go through and this barely made a dent. But my main goal was to try something new without waste. I shred and froze the rest of the zucchini to use throughout the year. See why I love my food processor? Line a large bowl with a clean kitchen towel. Fit your food processor with the shredder blade. Process the zucchini, potatoes, and the onion togehter. Transfer the mixture to the bowl. Wrap the towel around the vegetables and gently squeeze to release excess moisture. You want this as dry as possible for crispy pancakes. Remove the towel. To the bowl, add the egg, flour, and season with salt and pepper. Mix well. Begin your test batch: In a non-stick pan, warm 1 tbsp. of olive oil over moderate heat. Using a ¼ c. measure, scoop out some of the mixture and place into the pan. Flatten gently with the bottom of the cup. Fry on both sides until golden, about 5 minutes. Transfer to a paper towel lined plate and sprinkle with salt if desired. When cool enough to handle, give it a taste. If it needs more seasoning, adjust the rest of your mixture. Repeat this process until you have fried all of the pancakes. 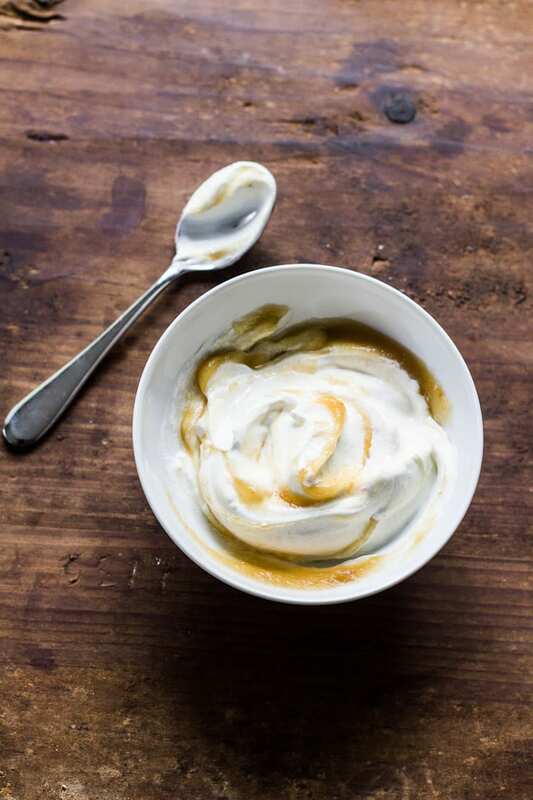 To make the marbled yogurt, add the yogurt (or sour cream if using) to a bowl. Add the applesauce. Swirl with a spoon. To serve, arrange the pancakes onto a plater. Garnish with fresh chives and yogurt sauce on the side. Those look incredible, a work of art! Hi Matt! Thank you so much! I just wish the kids liked them as much as we did. They’re the worst critics that’s for sure. I love this, looks like a great recipe for when you have reached a proverbial zucchini wall. They remind me of onion bhajis which I love! Hi Morgan! OMG. That sounds so good. Almost like mini spinach pies but in fritter form? I’m drooling. I actually love the “things sticking out”- they’re beautiful! Huge fan of the zucchini and these pancakes remind me of the Korean pancakes (pa-jun) my mom used to make when I was little. Thanks for sharing!! Thank you! At least somebody does ;) Now, I am so curious about your childhood pa-jun. I wasn’t sure what it was, so I did a quick search. Similar to scallion pancakes? I would love to hear about your recipe! Yes, I can relate to Zucchini overload but with recipes like that I say bring on the zucchini! Ahhh… you are so sweet. I will happily drop some off on your doorstep. Any excuse to visit sunny California works for me! As my zucchini have all grown into enormous marrows maybe I should try this rather than just ignoring them as they grow bigger every day. Luckily we all like ‘rustic’ and yours do look very good. I am SO over zucchini. Wow! These look incredible! 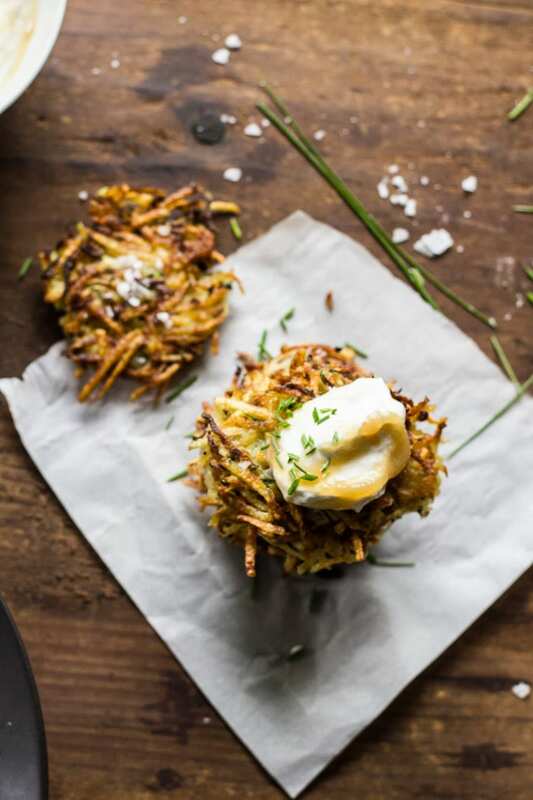 I love sweet potato pancakes, so I can’t wait to try them with the added zucchini! Pinned ! Haha, I love rustic and anything crispy – these pancakes look addictive! Me too! Kids though, they’re a whole different story! People always assume that my boys are great eaters and they are SO not. It’s borderline embarrassing, actually. One day they’ll appreciate good food :) Thanks Laura! What beautiful potato pancakes! They look so crispy too! These sound great! I love the rustic look, and I have to smile at the kids’ criticism-kids are weird. I have come to see that. And your photos, as always, are beautiful! 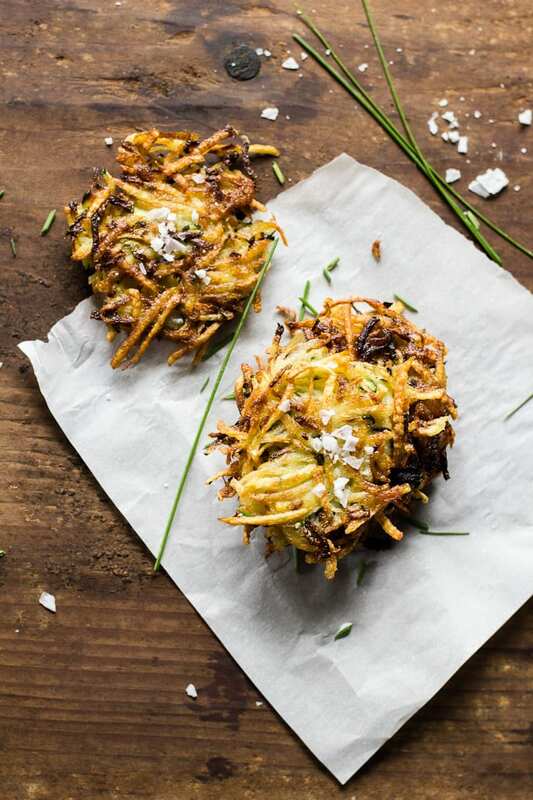 Emilie, I can never be over zucchini, especially if it morphs into these gorgeous fritters! 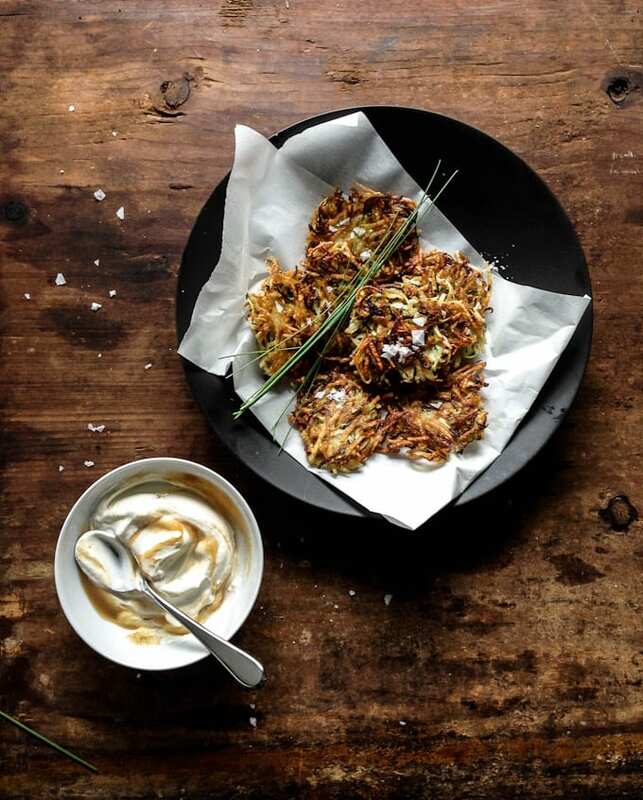 Love that applesauce yogurt–it totally puts a stop to my agony: sour cream or apple sauce on my latkes? I’m going to put this on every fritter I make now! You always get me craving the things you make! Reading this very pretty post means now I totally want zucchini pancakes for dinner. They will have to wait though, because there’s a ricotta pasta in the oven right now. Definitely bookmarking this for later. 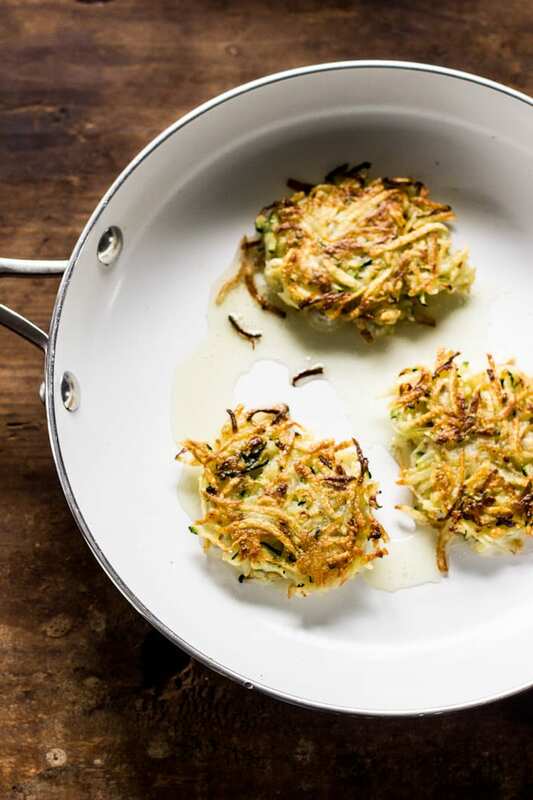 Crispy zucchini, marbled applesauce…what’s not to love? Why, thank you Ami! I hope you enjoy :) Thanks for stopping by! These pancakes look just so good! Love all the crispiness and that topping. Also, I’m so happy I stumbled upon your gorgeous space, Emilie! You have one more regular reader. This looks amazing Emilie – I love the sound of the marbles yoghurt sauce – yum! Stumbled across this recipe on Reddit and I need to give it a try, stat! I’ve been eating so much raw zucchini pasta lately that I’m getting bored of it, so this is the perfect recipe to switch things up with!